I remember a job from my contracting days where we were restoring some floors in a historic home in Denver. The homeowner was a cabinetmaker, and he was meticulous. We resanded the home’s original fir floors, and when it came time to coat them, I was using a waterborne finish that had just hit the market (in fact, all waterborne finishes were pretty new back then). The kitchen had floor-to-ceiling windows and a lot of can lights, and it seemed to be impossible for me to get a coat of finish on the floor that looked good. I kept trying different techniques, and I just couldn’t get it to be acceptable, at least not up to this client’s standards—what nine out of 10 customers would consider to be acceptable wasn’t good enough for him. I accepted his challenge of perfection and continued to embrace what seemed to be an unattainable feat. Finally I had to call my local finish rep to come out to the job, and with his help we were able to lay down a beautiful coat of finish and get paid. I learned a lot of lessons about finish from that one job, from customer expectations to how lighting affects finish and also when and where to try out a new finish. But I am not alone: You won’t find a wood flooring contractor out there who doesn’t have plenty of finish horror stories to tell. 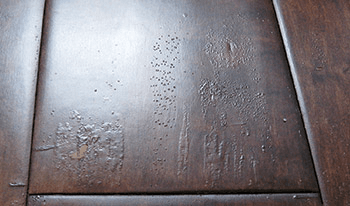 In this article I’ll try to share some of the most common finish problems I see and talk about things I’ve learned to prevent them. But before that, let’s talk about those customer expectations. • The floor should be observed from a standing position on the floor being assessed. • The evaluation must be conducted with ambient lighting, meaning the general illumination present in the room. As contractors we need to take into account what the lighting situation is specific to the job we’re on, whether that includes a big window or a row of can lights, and adjust our methods accordingly. • Glare from direct light sources must not be used during evaluation. You can’t introduce new lighting sources or wait until a certain time of the day to be able to evaluate the problem. Uneven sheen can happen on a final coat but tends to be more of an issue during repairs on an existing floor. In the picture on the opener page of this article, the contractor attempted taping off individual areas that needed repair. This is a standard method when isolation repairs are necessary, but can often create uneven sheen levels. 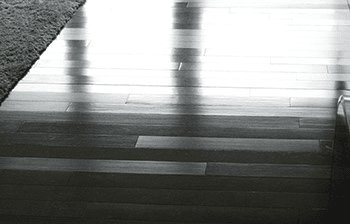 Mix the Finish Well: Whether it’s a new floor or a repair, mixing the finish properly is key. Matting agents tend to settle at the bottom of the container, so if the finish isn’t mixed well, the finish will usually start out shinier and end up duller. Expect Sheen Differences: If you’re coating a big area, mix all the gallons you need into one larger container; this is called “batching your finish.” The sheen can vary slightly from one gallon to another or from batch to batch, so mixing the finish together avoids problems with these minute sheen inconsistencies on your floor. Also, never assume that just because two different finishes are labeled the same, like “matte” or “satin,” they will have the same sheen. Sheen levels are inherent to specific finishes and can vary from one manufacturer’s product to another. For example, one satin product may have a gloss level that’s 15-20 and another product may be 25-30. Sheen levels are proprietary to the products. 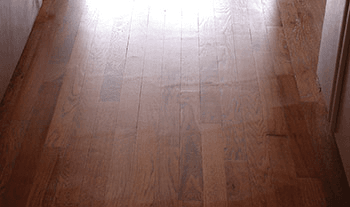 Match Sanding Sequences: The scratch pattern on the flooring surface affects how light reflects off the finished surface. If you have a floor that you final screened with a 220-grit and you hand sand the perimeter of the floor with 120-grit, the gloss level of the final coat will ultimately be different around the perimeter than in the field based on how the ambient lighting is reflecting from the surface. Keep Consistent Mil Thickness: Say you’ve got a 1,000-foot floor and two gallons of finish. You’re on your last stretch and realize you’re running out of finish and may not have enough to finish the job, so you start putting more pressure on your applicator and begin squeegeeing out finish to ensure you get a coat on the whole floor. You will most likely get a callback due to sheen variation. The thickness of the finish affects the appearance of the sheen: The thicker the coat, the higher the gloss level. Use a New Applicator: Many contractors like to reuse their applicators by washing them out and storing them in containers full of water. Regardless of how clean you think you’re getting it, it’s almost impossible to get all the finish out of an applicator. Applicators are specially designed to hold onto finish; any remaining finish in the applicator will be transferred to the subsequent coats and can interfere with your final coat. Many of us have always cleaned out our applicators after every job and reused them on the next job without problems. The problem is the one job that goes south and becomes the job we don’t get paid on—that can set us back weeks, if not months, in revenue. Keeping a fresh applicator for every job takes one more variable out of the equation for potential failure. If you’re adamant about reusing your applicators to save a few pennies, I recommend using a designated applicator for build coats and always using a new applicator for the topcoat (just be sure to de-shed it first). Build the miniscule cost of a new applicator into every job. Give it Time to Cure: Finish sheens can change slightly (or “mellow”) as a product cures out. If you’re trying to match an existing finish, make sure you let your finish totally cure before you determine if it’s a match or not. I’ll never forget the lady who called three hours after I finished her job complaining that there were shiny spots on her floor. When I went to her house two days later, everything was perfect. Feather Finish In: When doing repairs, take your time to assess the repair area and determine whether you will be able to feather in your repair or need to cut it off at good breaking points (doorways, cabinets, etc.). I like to use the analogy of an airplane taking off and landing when discussing feathering finish. Many times you can blend areas by simply feathering the finish into the field. This method of repair is acceptable when a) you know the finish you’re matching and b) your customer understands the importance of evaluating the repairs after the repair area has fully cured out. Thin Down the Finish: Depending on your finish, you may be able to thin it down and apply multiple thinned coats. This gives you more control over the build and final appearance. Some waterborne finishes can be thinned down by adding water, and some oil-modified poly can be thinned by adding mineral spirits. You have to check with the manufacturer to determine if that will work for the product you are using. This method is extremely helpful when I have an isolation repair and need to build up the finish at the repair area for a perfect match. I like to apply multiple thinned coats to the area of contention, then carefully blend out subsequent coats beyond the area for the final blending. When I do this, I use a hair dryer or a heat gun to speed-dry each coat and determine how my sheen levels and build compare. Recoat Everything: When in doubt on repairs, I would simply recoat the entire area or room or find good breaking points. One good approach is to look for areas in the room where the light sources affect the appearance of the floor. Perhaps there’s a row of windows or different lighting sources that already create a difference in the perception of the finish; those are great areas where you can determine whether to feather repairs or to find a breaking point. If sheen inconsistencies become a thorn in the job, usually abrading and recoating the entire floor will fix them. Lay it Down and Leave it Alone: When I teach someone to coat a floor I tell them to focus on a manageable work area—about 3 by 3 feet—where you can comfortably keep focus on small areas without overextending yourself. Focus on that one small area and ignore the rest of the floor. If you see a small puddle or a spot you missed 6 feet out, don’t touch it. Once the finish is dry you can do minor repairs, and that’s easier than repairing a big area of overworked finish. Depending on the finish and the humidity on the job site, you may have a very short window of opportunity to touch that finish again once it’s down. This is also a common issue when you haven’t mapped out your coating strategy prior to application. Don’t Wring Out Applicators: The most common cause of bubbles I see in the field is when guys continuously “wring out” their applicators during the application process. This is not uncommon and actually a natural instinct to keep the applicator free from drips. Keep in mind that when we force the finish from the foam applicators, we introduce air into the applicator in its place. This will always introduce air into the finish we are applying and cause foam or bubbles. Rather than “wringing out” your applicator, get into the habit of tapping excess off. Don’t Use Old Finish: Older or expired finishes can be foamy or bubbly due to the defoamers that can break down over time. Proper mixing of your finish is critical to how the finish performs. Always know who you’re buying your finish from and know where to check for the batch codes of each product you’re using. Create a Strategy: Probably the most important step of applying finish is mapping the job prior to getting started. When you’re coating a large cut-up floor, detail out a strategy for coating the floor in sections before you start. This way you won’t end up in a situation where you have an area half-coated and have to come back later. Figure out good cut-off points and use tape lines as necessary. Control Air Flow: Air movement across the finish causes it to not flow and level as it’s designed to do, so the more air flow there is when you’re coating, the more likely it is you’ll have problems with coating, uneven finish, debris in the finish, streaks, etc. While you’re coating the floor, make sure the HVAC system is turned off. As soon as the finish is skinned over, you’ll want that air flow circulating again to help evacuate the solvent from the air. The easiest way to do this is to program the thermostat so the HVAC is off while coating and kicks back on when you think the finish is ready for air flow (usually 30 to 45 minutes later). One thing that can be more difficult to manage is the fan under the refrigerator. The only thing to do for that is to turn off the breaker for the fridge while you’re coating (just remember to turn it back on!). Use Finish Retarders: If you are concerned about the finish drying too fast, you can slow the dry time of some finishes by using retarders. Some finish companies offer their own retarders that extend dry times. For some finishes you can slow drying simply by adding water. Check with the finish manufacturer to see if slowing the dry time is possible and what the company recommends. The best way to repair these issues is to abrade and recoat. Choose the Right Applicator: Always use the applicator your finish manufacturer recommends to apply their finish. If your finish can be rolled, use a roller instead of a T-bar. You’ll prevent most lap lines when rolling due to how the roller applies finish to the floor. A roller simply picks up the finish and then lays it back down uniformly, rather than pulling or dragging the finish as we do with T-bars or lambswool applicators. Rolling finish is an excellent method to alleviate lap lines. If you need to use a T-bar, it’s easier to back out of a space using a lightweight T-bar than a heavyweight T-bar. Use a Tape Line: If you have big areas you need to coat, use a tape line along board edges at tie-in areas. You can coat right up to that tape line, and then when you pull the line you have a nice straight edge you can cut back into. I always coached my guys to treat that taped-off area as if it were expensive white carpet—cut into it carefully so that you don’t overlap to potentially create a new set of issues. Coat a Walk-Off Area First: This is a trick I learned in the gym floor business that also works great for residential jobs. It takes some extra time, but it’s worth it if you have difficulty backing out of a room. Say you have a hallway where you know you’ll be ending the job. Start by using a tape line to coat half the length of the hallway and let it completely dry. Once it has dried, begin coating on the opposite side of the room. When you’re almost done coating, you can walk on the already-coated half of the hallway and pull the finish straight over the uncoated half of the hallway instead of having to back out. If you have lap lines in your final coat of finish, you will likely need to abrade and recoat the floor using one of these methods to avoid getting them again.